Were you a member of the 4-H as a kid? If so, you can go back to your roots this weekend. (And let me know, I’m curious to hear the story.) If you weren’t, even better to get you some real farm experience. Even though I featured the Beef Round-Up last year, I didn’t make it there, but I’m hoping to go this year. You can basically think if as a dog show, only that the middle-aged ladies with their poodles are replaced by farm boys and girls and their livestock. There is not too much information for visitors (I’m not even 100% sure if this is open to the public), and the website has not too much information. We’ll see! Update: Walter Earle with NCSU commented that this is indeed open to the public. Thank you, Walter! 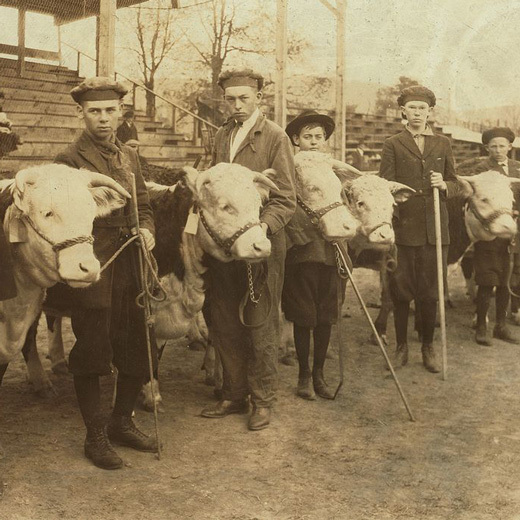 4H Cows By Lewis Hines [Public domain], via Wikimedia Commons. This is image is from Charleston WV, and was taken back in 1921. Here is a video from the event I took today. This entry was posted in Americana, Animals, Food, Indoors, Raleigh, Stage by daddyweekly. Bookmark the permalink. The Jr Beef Round Up is open to the public and everyone is invited !!!! Thanks for the information Walter! We’ll be there.